LAST ONE! 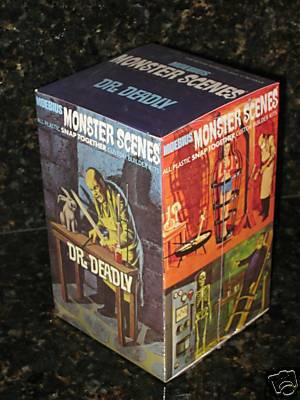 This Dr Deadly all-plastic custom builder model kit is the perfect gift for monster fans! It's a reissue of the notorious Aurora MONSTER SCENES model series from the early 1970s. Kit #631. These controversial kits from the early 1970s caused quite a stir with community groups which allegedly picketed the headquarters of the parent company of Aurora, demanding the MONSTER SCENES models be pulled from store shelves. The company bowed to the pressure, and the models were never seen or sold again UNTIL NOW! Retro-styled kit originally issued in 1971 measures 6" x 4" x 4". Paint not included. Cement not required to complete model. Modelers Note: The stock photos show the box art and a sample built and painted model kit. Brand-new, factory sealed thin-walled boxes are NOT intended as collectibles. The box of the last one we have in stock has a dinged corner.